Currently, when you setup auto AWAY and auto BACK, AWAY will make you go away on all networks. However, to come back you have to go to a channel in EACH network to make yourself come back. If I'm logged into 4-5 different networks simultaneously, this is cumbersome. So, similar to how auto AWAY makes you away on all networks, please either make standard or add a checkbox so auto BACK brings you back on all networks. ...Now that I think about it... does auto AWAY, truly make you away on all networks at the same time? That may need to be verified as well. He means to add the "All networks" item into the COMBOBOX http://i.imgur.com/KBV69mq.png that will effect any above setting into all the networks. Away works on a per server basis. "Automatically set away" works by checking how long since you last sent a message to a server on each server individually. 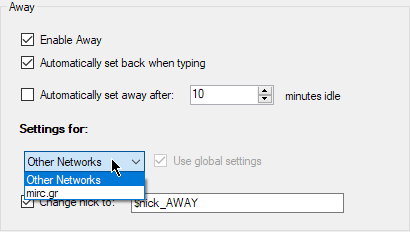 "Automatically set back when typing" works as designed, it eets you back when sending a message on that specific network, the text might be misleading/confusing, I'll fix the text. I'll think about adding a option to use global away and back.